Campeggio De Bois-Redon si trova a Septfonds, Tarn e Garonna, è situato in una zona boscosa. Questo campeggio dispone di piazzole sia ombreggiate che e piazzole poco ombreggiate. È possibile affittare bungalow. Il campeggio dispone di un parco giochi e di un campo sportivo. Per gli sportivi, il campeggio prevede passeggiate con accompagnatore e diversi percorsi in bicicletta. Il campeggio dispone di una piscina scoperta. The chalet fulfil our desire to offer you a compact and comfortable chalet that fits well in our woodland area. You enter by the porch through the double doors straight into the kitchen. Thus, you have everything on hand if you have your meals inside or outdoors. The kitchen is equipped with a 4-burner gas cooker, a microwave, a refrigerator, coffee maker and all kitchen utensils. The terrace has a wooden table with four chairs. There are also two loungers to enjoy the sun or shade. We supply pillows and duvets for each bed. If you do not want to take your own sheets and pillowcases, then you can rent them on site. Optionally there is a baby package for rent, consisting of a cot and high chair. Ogni anno un ispettore visita il Campeggio De Bois-Redon, controllando oltre 200 tra attrezzature e altri punti di interesse del campeggio. L'ispettore è un dipendente ACSI e non lavora per il campeggio. A sloping site in a lovely location with pitches in amongst trees, but it was a nightmare trying to find some level ground (could be a problem if the site is busy). The toilet block is quite new and was nice and warm, but the showers were no where near hot enough (barely lukewarm). The campsite owners were very friendly and helpful. Nice woodland site, toilets (which appear relatively new) very clean but expected to remove footwear before going into toilet block. Owners helpful & friendly - no tumble (clothes) dryer but owner VERY kindly dried our washing in their machine. Out of season so site very quiet. Excellent woodland site. Very quiet out of season. Very friendly helpful Dutch owners. Excellent sanitary facilities but a bit limited for winter. We arrived in our motorhome at 17.20, drove in and stopped at Reception. Nobody was there. A notice in 3 languages said words to the effect - "Nobody is about.Site yourself". We drove around the site looking for hard-standing. We passed another UK motorhome parked in a bay opposite a bungalow - so assumed this type of parking was acceptable. We parked in a space by the toilet block and hooked up to the electricity in a box opposite. Twenty minutes later as we were preparing a meal there was a knock on the caravan door. My wife answered. A man with a torch, not saying who he was, asked how long we had been here. We told him. He then asked why we had not phoned or called at his house? He seemed angry and agitated. We said we had seen his notice, but had not seen anything about phoning. He then started telling us how rude we were. He asked how we would like it if somebody came to our house and did not tell us. We apologized again saying we had not seen any instructions to phone or call in. I offered to pay the camp fee there and then. He asked me when we were leaving, I replied as early as possible in the morning-probably about 9am. He said he would be at the office then. He left. Ten minutes later there was another knock on our caravan door. It was the same man saying he had changed his mind. At first we thought he meant he wanted paying now. "I don't want you here. You must leave. You must leave straight away. We apologised again. He would not accept this or listen to reason. He kept saying "You have to leave. I do not want rude British people on my site!" He then said "If you don't go I will get my tractor and pull you off the site. You will see!" He left. A few minutes later he opened our caravan door and threw the electric cable into the motorhome. He was so angry at this point that we packed away & departed without inspecting the outside of our motorhome. Had we done so we would have seen that in removing our cable the man had broken off the flap that covers the electrical connection. He did not tells us this when he threw the cable into our van! We left the site confused and upset at the man's angry and aggressive behaviour – which escalated to racist insults (being called rude British), threats of physical action (towing off our motorhome) and damage to our vehicle (the electric flap). If we had done wrong, in the man's eyes, we had apologised-to no avail. At no time did we raise our voices or provoke this man. We have had 17 years motorhoming all over the world and NEVER faced behaviour like this. Impressed by very friendly greeting on arrival and help with sorting out a good pitch where we would get sun and good English TV reception. Lovely area in which you could pitch as you please with no regimentation. Really helpful owners who, during our week's stay, took one visitor to the dentist and waited while he was treated, and also helped change a punctured wheel on a motorhome. Bread was delivered to our caravan each morning and if they could have produced better weather we feel they would have done! Very friendly and helpful owners. Even brought your bread you ordered to your pitch. We were asked to park on the road due to the wet state of the pitches which was really helpful. This campsite is work in progress as work is still being done to improve it, but don't let that put you off. The toilet facilities were good, but an unusual set up with all the WCs in a line at the rear of the block. Very hot water and good showers. The site can be a bit difficult to locate and at the end of a single lane road. Volete prenotare il campeggio Campeggio De Bois-Redon o oppure saperne di più? Potete farlo usando i seguenti dati oppure tramite il sito del campeggio. A20 uscita 59, direz. Villefranche/Rodez. Poi D926 per Septfonds. Spegnete il navigatore. Dopo la rotatoria prendete terza a sinistra e seguite cartelli. 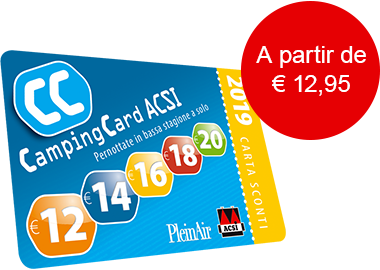 ACSI Eurocampings invia la tua richiesta di informazioni al "Campeggio De Bois-Redon".